Published By – New World Music Corp.
Uncredited liner notes in English, translated (DECCA 1987) to French and German. Recorded at Masonic Auditorium, Cleveland, Ohio, November 1985. Hamburg Steinway D's and piano technical services by Pro Piano. ℗ 1987 The Decca Record Company Limited, London. © 1987 The Decca Record Company Limited, London. 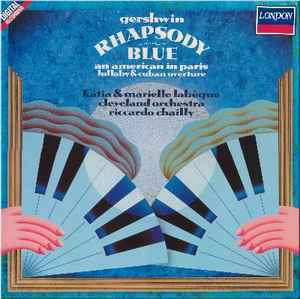 Spine string: "Gershwin: Rhapsody In Blue · An American In Paris Labèques/Cleveland Orchestra/Chailly DECCA 417 326-1 DH"
"Digital Recording" in a blue/red banner abone spindle hole..
℗ 1987 The Decca Record Co. Ltd.
Rim text message in English with "Made in Holland · The Decca Record Co. Ltd" at 4 o'clock.